The San Francisco Giants have endured a lot of injuries that have held them back this season. But things may finally be looking up in that department. Johnny Cueto, who was the best pitcher in baseball the first month of the season, made his long-awaited return from the DL Thursday night. Meanwhile, Jeff Samardzija is expected to make his return from his second DL stint of the season on Saturday. Cueto has been out since early May because of elbow inflammation. The team was initially worried that his injury would require season-ending Tommy John surgery. However, after a little more than two months on the shelf, he made his return from the DL Thursday night against the Cardinals. Unfortunately for Cueto, his first start back was not what he had hoped. After allowing a total of three runs of 32 innings in his first five starts, Cueto gave up four runs in the first inning against the Cardinals. He managed to settle in after that. 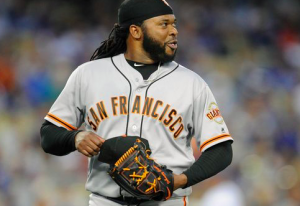 But Cueto ultimately gave up five runs in five innings, taking the loss in a lopsided 11-2 loss for the Giants. Nevertheless, Cueto was satisfied with the outing. Giants manager Bruce Bochy is also hopeful that Cueto will continue to improve. Despite Cueto’s velocity being down, topping out at 92 mph, he believes the veteran can make it work. Meanwhile, Samardzija will pitch for the Giants Saturday for the first time since experiencing tightness in his shoulder at the end of May. Prior to the injury, Samardzija was having a rough season. In eight starts, he’s 1-4 with a 6.56 ERA. He also missed time earlier in the year with a pectoral injury. But Samardzija says he’s a lot more confident coming back from injury this time around. With both Cueto and Samardzija returning around the same time, the Giants suddenly have a deep starting rotation. Madison Bumgarner has also started to return to form since returning from injury a month ago. If Cueto can come close to being the pitcher he was early in the year, San Francisco will have a potent 1-2 punch at the top of their rotation. Samardzija, meanwhile, could be an important X-factor the second half of the season if he can pitch better now that he’s healthy. With four straight losses, the Giants are 3.5 games out of first place in the NL West. However, the Giants have done well to tread water all season without the key figures of their starting rotation available. With their rotation finally healthy, now could be their time to make their move and begin their push for a playoff spot.